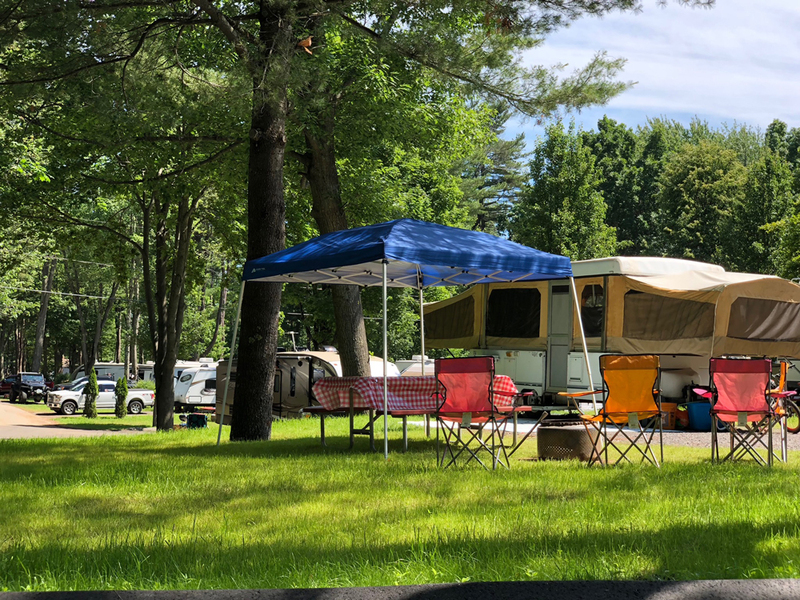 At Hid‘n Pines RV Resort, you’ll find a quiet family camping oasis just minutes from the exciting Maine attractions in Old Orchard Beach. We offer spacious full hookup RV and tent sites with amenities like a large heated swimming pool, playground, and basketball court to make your stay with us even more enjoyable. You can also enjoy refreshments at the café or purchase handmade and local items at our convenience store. Our fantastic location in Old Orchard Beach is close to everything you could need. Enjoy nearby shopping outlets, an eighteen-hole golf course, a great selection of restaurants, and plenty of other enjoyable entertainment. You can also catch trolley rides to and from Hid‘n Pines to spend some time in the sun at beautiful Old Orchard Beach and its famous Pier. Camp out under the stars in the gorgeous pine forests of Maine. Our wooded basic tent sites let you get back to basics and are centrally located by our great resort amenities. We make RVing easy at Hid'n Pines. Enjoy big rig friendly roads that make it easy to maneuver through the resort to and from your site. Our spacious RV sites can accommodate any size RV with plenty of room for slides. At Hid ‘n Pines, we offer fully furnished vacation rentals that offer many of the comforts and conveniences of home. Become a seasonal and enjoy hassle-free vacations all summer long! Check back soon for more special offers at Hid’n Pines! The seven miles of sandy beach stretching away from the downtown area is undoubtedly Old Orchard Beach’s main attraction. But when you’ve had enough fun in the sun, there is always something else to do. From deep sea fishing and whale watching, to shopping at the outlet malls in Kittery and Freeport, experience what else this area in southern Maine has to offer!